Pick-up locations are the places that the driver and passengers board the vanpool on their way to work. Whether you are an applicant to the Metro Vanpool Program or you are enrolled as a Volunteer Participant adding passengers using a Vanpool Update form, Metro requires the complete street address for your pick-up locations. Use this interactive map to find the complete street address for your pick-up location. You can use the search box in the upper left corner to search on a city or neighborhood name, intersections, and street names. Or, you can also zoom in and re-center to the area near your location. Find the address for your pick-up location by clicking on the green markers. 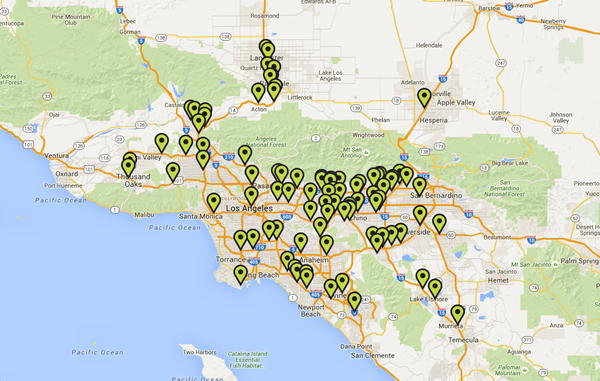 If your pick-up location is not on the map, call the Help Desk, 213.922.7003. We will be happy to help. Metro provides this Interactive Parking Map (the “Map”) for informational purposes only and its sole intended use is to assist existing Volunteer Participants and applicants to the Metro Vanpool Program (the “User”) in providing a complete street address when filling out an application, or Vanpool Update form, for the Metro Vanpool Program. User is wholly responsible for completing all transactions required to access the parking location whether on-street or off-street and shall comply with all posted parking regulations. Unless otherwise noted, Metro does not control, endorse, approve or check the availability of parking locations or the accuracy of the information provided regarding the parking locations listed on the Map. Metro does not accept liability for any loss or damage of any nature arising directly or indirectly as a result of any User’s use of the Map. User hereby releases Metro and its officers, directors, agents, affiliates, subsidiaries, and employees from all claims, liability, demands, damages, expenses, and legal fees, arising out of User’s use of the Map.